Have you ever felt as though you can’t breathe? I’m not talking about actually losing your source of oxygen but the surreal feeling that you just “can’t” take a deep breath. During my senior year of college, I had a non-paying college internship but I was also working a few part-time jobs to pay my bills and supplement my college career. On top of that, I commuted an hour in each direction – to my State University – twice a week for a 12 hour school day. Now, this is not a pity party. I did what I had to do and actually was having a lot of fun doing it. However, I reached a point to where being the energizer bunny 24/7 finally caught up with me, but I hadn’t even realized I was being chased until it was too late. One day, while commuting to my University, I started to feel like my heart was going to beat out of my chest while my clammy hands felt like pins and needles. Also, I started to hyperventilate and, the more I thought about it, the worse it became. I pulled off to the side of the road and got a grip, but I was still shaky and having a hard time catching my breath for the rest of the day. I had a few more episodes like this and decided it was time to see my doctor. The Doc asked me some general inquiries about my life, diet, exercise and the nature of these episodes; He then diagnosed me with Anxiety or Panic Attacks. He told me that I should cut back on work (how could I afford it? ); get more sleep (when? ); and to try and take it easy (impossible!). So, he sent me on my way with one prescription (no refills) of Xanax to get me through to the end of the year. I am happy to report that, once I had graduated from college, the Anxiety Attacks pretty much went away. Over the next two decades, I would get one here and there if things were pretty stressful but, for the most part, they were fleeting…until a year ago. I was dismayed that I started getting those darn Anxiety Attacks again. Yet, they came at a time when I was under a lot of stress, so it was not surprising; but here I am a year later and I’m still getting them periodically even though I don’t have any “true” stress in my life. Once again, I set out to consult a doctor but, this time; it was an acupuncturist who also specializes in Traditional Chinese Medicine. I don’t like to take any drugs if I can help it and that even includes over the counter pain relievers like Tylenol or Advil; so there would be no Xanax prescribed here. Dr. Chung suggested some herbs to help me relax but, most importantly, he told me to meditate and relax. You would think that would be total common sense right? Well, I did and that is why it made me feel hopeless. I had been trying to meditate for years now. A few years ago, I had an affair with yoga and would spend the entire class just dying for the instructor to say it was time to get into Shavasana or corpse pose. This is perhaps the most important part of yoga practice because Shavasana allows the body to regroup and reset itself. Yet, I am unable to shut my brain down enough to meditate and realize these positive effects. I’ve tried numerous times and it always ends with me thinking about the most random thoughts such as what we should have for dinner; or even worse I fall asleep. So, I have yet to find my way to Nirvana, but I haven’t given up trying and, believe it or not, technology has helped me to bliss out. 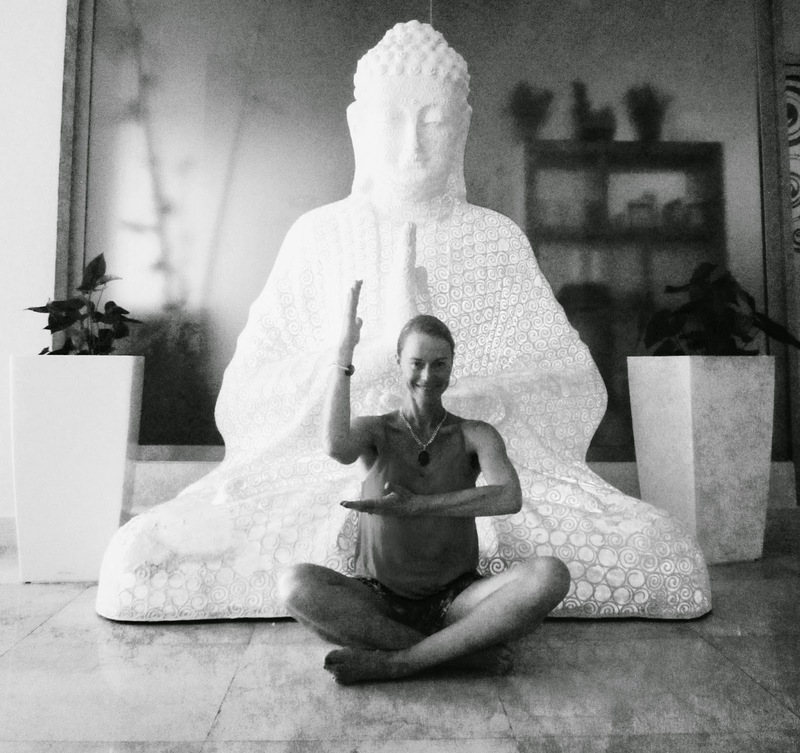 A few times a week, I set my timer on my iPhone for 3 minutes and, while sitting at my desk, I focus on breathing in and out for three seconds each. My mind still wanders but, if I’m having minor anxiety, it does help to relax me. Also, I downloaded a free app that offers a creative visualization meditation before going to bed. My son and I have been doing it together and we both find that it does help to wind us down for bedtime. I am trying my best, but I know that it is not enough if I want to banish anxiety from my life. I must find the time to meditate and make it a daily occurrence. I wrote this post to get my message out there to the Universe so hopefully, tomorrow, I can just breathe. 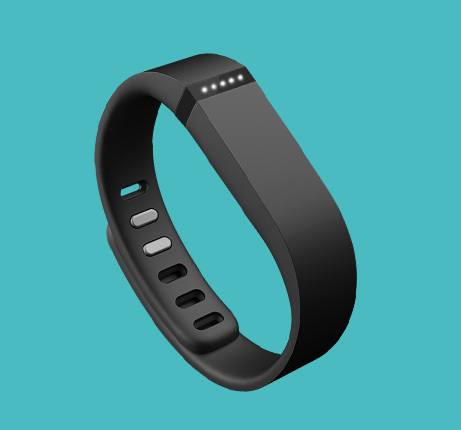 To be honest, while trying to conjure up ideas for Christmas gifts for my husband (who refuses to give me a list), I actually thought about a fitbit for him for a split second and then I thought about it for myself. Unfortunately, the lightbulb came too late in my process since I have my list for Santa completed by Black Friday. So, I was pleasantly surprised when Jason gave me a Flex fitbit. First, the disclaimer: I'm already an exercise junky; addicted to keeping track of my fitness, food logs, etc. so this little toy has taken me to the next level. Not only can I keep track of my exercise and calories burned working on my fitness, but it logs my steps, calories burned throughout the day just by living life. It monitors my sleep too and, by logging onto www.fitbit.com, I can keep track of it all plus it has a food and exercise log. Oh yeah, the Flex is also waterproof, so you can wear it in the shower. Did you know you can burn 173 calories per hour while showering. It is a crack addicts...I mean exercise fanatics dream come true. Growing up Jersey-style, I had (and still do) an appreciation for the foods of my youth. At Sunday dinners, my non-Eye-talian Grandmom would serve a baked ziti so mean that it would make Tony Soprano sing Falsetto. The aluminum pan would emerge from the oven hot, heavy and bubbling its cheesy goodness like lava from the center of the earth. The boulder size meatballs would stew in the little tubes of goodness which would be well-done and burnt on top to create a crust which resembled the city of Pompeii after the eruption of Mount Vesuvius. Afterwards, while the Giants game played in the background, my aunts and uncles and I would lie on the floor of the living room, amongst discarded pages of the Sunday paper, in food comas looking like those poor Pompeians frozen in time. Now, where there is fire there must be water, and it is all about the wooder in Jersey. In my opinion; pizza, bagels or hard rolls from New Jersey cannot even be compared to those glutinous bread products here on the West Coast. The hard water that runs through our L.A. pipes plumps up the dough so high and stiff that it seems like I'm eating the letters from the infamous Hollywood sign. In New Jersey, the soft water used to make thin crust pizzas, which are cooked to well-done perfection, is holy as far as I’m concerned. I mean, it has to be Godly to get those hot bagels, which are always oozing with cream cheese, so soft and springy. Thank you Jesus! 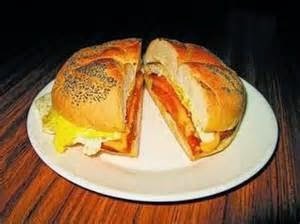 It is truly the combination of all those ingredients – a fried egg, the pasteurized and processed cheese product, and pork roll all between a poppy seed hard roll – which makes a PRE&C so delectable. However, I’m sure the combination of those same preservatives could possibly cause a heart attack. When I mentioned this to my now husband Jason, he was shocked. His mom was a first generation health nut and he grew up eating food mostly in its natural state. One day, early in our relationship, he asked me if I ate vegetables on a regular basis. I affirmed that I did when a side salad came with my meal at a restaurant. He asked if I took vitamins and I replied that I took the Flintstones kind when I was a kid. Thus began my conversion from being an equal opportunity eater to a real foods connoisseur. It was a slow process spanning 20 years and, despite the fact that I refuse to deny myself a splurge here and there, I have changed the way I view and eat food. I won’t lie; living in Southern California makes this very easy because we have healthy choices all year long. Jason and his family – who had grown up living healthfully – changed my life. My sister-in-laws turned me onto Linda Rector Page and her Healthy Healing series (http://www.healthyhealing.com) which promotes using whole foods and whole herbs to have real health. I started spending my whole pay check at Whole Foods and Trader Joes on fit foods and supplements. I learned that eating healthy can be satisfying and delicious but, most importantly, good for you. For years now, my rule of thumb is that I eat pretty much eat the same thing every week day: a half a banana; “REAL” oatmeal with berries for breakfast; yogurt with fruit as a mid-morning snack; salads for lunch every Tuesday and Thursday; sandwich, soup and carrot sticks on those odd days; and an afternoon snack of either pretzels and mozzarella string cheese or a rice cake with hummus. Boring, right? Well, if I get bored I mix it up and I certainly go off the rails now and then. Then, about two plus years ago, I stumbled upon Lisa Leake’s blog 100 Days of Real Food (http://www.100daysofrealfood.com/). She and her family went 100 days without eating a single ounce of processed foods or refined ingredients. To this day, she encourages her readers to take the pledge but even as minimal as 10 days. Although I was inspired, I did not make the pledge, but it gave me a lot to think about. The final straw came last year when my symptoms of GERD (aka acid reflex and heart burn) became severe. I knew that I had to take eating healthy to a new level and cut out or cut back on all those nasty little triggers: spicy foods; fried, greasy foods; high fat meats; butter and margarine; chocolate; peppermint; sauces and dressings: caffeine and alcohol. I felt so horrible that it was actually easy to give up a lot of those bad foods. Yet, there were a few indulgences I would not say good bye to such as my daily coffee and love of wine varietals. On both accounts, I was able to find a low-acid coffee and white wine so all is well with my world. The past year has been filled with a lot of trial and errors, but I have finally found what works best for me and, at times, unfortunately, what does not. My GERD can take me out like a Jersey mob boss with a baseball bat to the knees. Bada bing, bada boom! The good news is that on a recent trip back to New Jersey with my son, I was able to sample all of those comfort foods of my youth. It just had to be done in moderation. The whole week, I vacillated on whether or not I would indulge in a PRE&C. Two hours before our ride to the airport, I called Frank’s Deli to place my order. The women who answered said it would be as long as an hour and 15 minute wait for it. I said yes and she said you’re crazy. With only minutes to spare before our car arrived, I cut that bad boy in half only to stare in awe at the steam as it rose from the pink center of that long awaited delicato. Quickly, I ate my half and then my son finally took his first bite of pork roll. He looked up at me and smiled with a big grin, dotted with poppy seeds of course, and said yum.